When summer arrives, I usually like to bike to other neighbourhoods in Chicago and have a brief walkabout. There is usually some new discovery or me finding something that I missed during my first visit. With Logan Square going through so many changes, I decided to take a stroll through my neighbourhood to see what was new and to also check out something old. 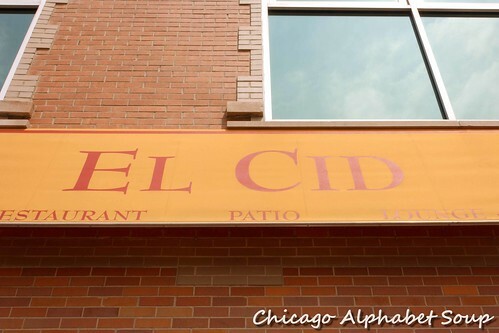 This past Sunday, I finally went to what I imagine has been a staple in Logan Square — El Cid at 2645 N Kedzie Avenue. With nice weather, mildly humid from passing rain storms earlier in the day, I took advantage of the outdoor seating. I had a taste for a flight of mojitos, but the server recommended a margarita instead. His recommendation was a winner, and I paced myself downing it while devouring a basket of chips with a side of tomatilla salsa and another side of pica de gallo. The tomatilla salsa had a bite to it, a strong indicator that it may not have come from a jar. The pica de gallo was a winner. I swear it was doctored up with a mole and much like cilantro, mole goes great with everything. There was so much on the menu that I had found appetizing. 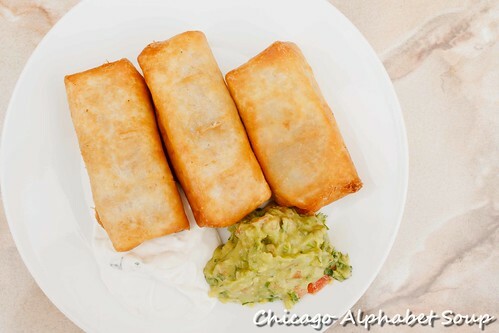 Being quick, I ordered vegetarian chimichangas. Served with dollops of sour cream and guacamole, these rolled tortillas stuffed with black beans, tomatoes, onions, rice, and cheese were fantastic street food snacks for my outdoor sit-down. By the time I had finished the basket of chips with salsa and the chimichangas, I was completing my margarita. I ordered another one. Another appetizer I tried was a tamale. Delicious! 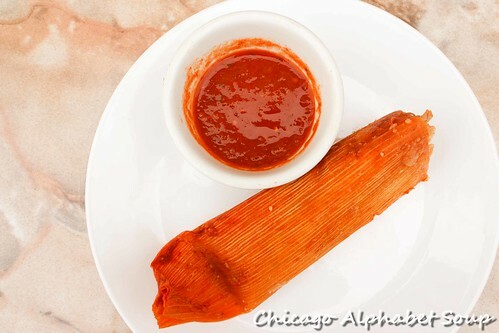 There was nothing store-bought about the tamale. Not only did it come wrapped in a corn husk, but it was packed full of taste. My server had warned me about the red sauce. He mentioned that a dab will do you. The sauce was of the variety that people trying to prove a point will try. It has been loaded with habanero peppers. Nevertheless, I recommend the tamale. The red sauce looks good on the side only. For an entrée, I settled for a seafood option. There was a salmon plate that came with Spanish rice and frijoles. 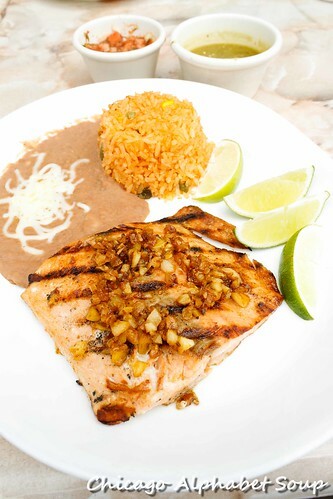 Topped with a garlic salsa, the salmon was juicy and tender. The food smelled so good that I didn’t photograph as many shots as I normally do. And once I had my first fork of salmon along with some rice and the frijoles, I had declared the dish a winner, definitely not the usual enchiladas, tacos, and the like. 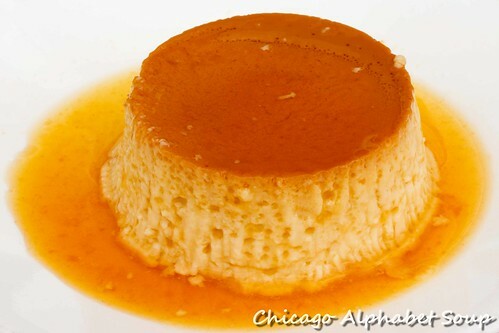 I went with a traditional Latin American dessert option: flan. This flan had coconut in it. And given the additional ingredient, one would think the texture would be coarse. No, the flan was smooth as a quesillo. It felt like slicing through melted butter and it tasted like bliss. I made a note to myself to be more aggressive in the gym this week. Flans are not necessarily friendly to the cholesterol and a third margarita isn’t particularly helpful when you’re trying to flatten your tummy. El Cid has been on the Logan Square landscape since I moved to the neighbourhood several years ago. I was always under the impression that their doors opened at 5:00 PM, so I passed by it during the day on weekends and thought nothing of it. Yelp should update its page to reflect the proper time. At any rate, the service was top, the food was worth several more visits, and the price was extremely reasonable. I’ll have to remember El Cid, the idol of Spain, for the next time I return to the namesake on N. Kedzie Avenue. I’m sure he’ll pass my mind briefly before my third margarita. Wondering what to have for lunch, I was in Wicker Park on the hunt for a Pakistani restaurant that turned out not to be open for business yet. During the middle of the afternoon, restaurants in Wicker Park have lines out the door. My appetite does not play nicely when it comes to waiting. It is almost like a little brat, constantly making my stomach growl, which makes me grumpy. Well, across the street at 1360 N. Milwaukee Avenue was Antique Taco and it looked like there was plenty of seating. Not that any seat had my name on it, there was some food that needed to be shown that I loved it. 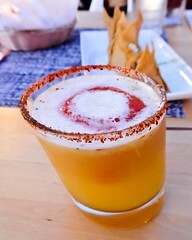 Strawberry ginger margaritas. 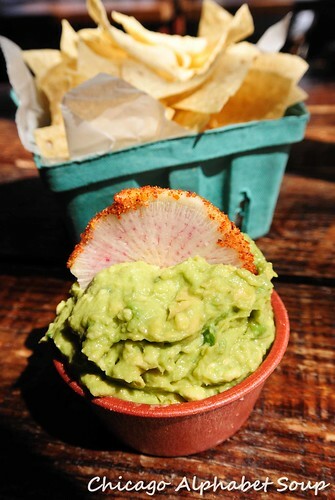 Guacamole and chips. 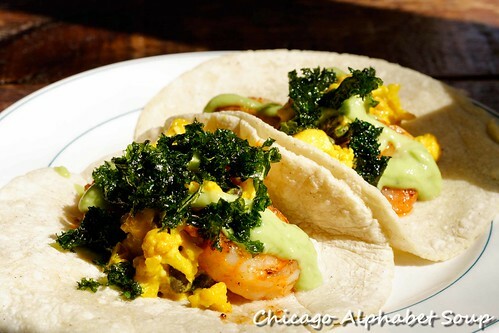 Garlic shrimp tacos. Keema empanada. Let me first say that the price for the entire meal came out higher than I expected. I should have paid more attention to the prices while I was being excessively hungry. But that was not a problem. 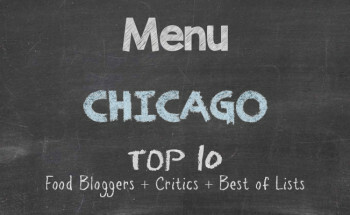 When I look back on the experience, the delectable component of the food justified the cost. I had recently been spoiled by having some awesome chunky guacamole at a Mexican restaurant, so the creamy guacamole at Antique Taco was good only to me in comparison. 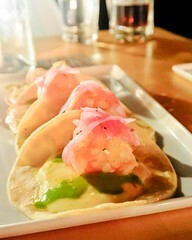 The shrimp tacos were worth writing home about, and ordering again during future visits. When I say that the addition of cauliflower elote and the creamy avocado basil salsa worked divinely in the recipe, I’m actually shouting it. What would have otherwise been two bland tacos were food fantastic. The keema empanada reminded me of keema samosas that you get at Indian restaurants. The meat was in a sauce rather than simply flavoured. 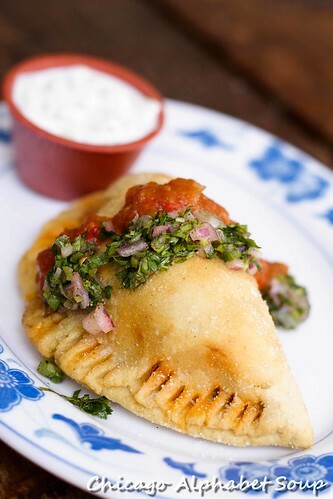 Beware that these are not small, cute empanadas, but rather small one-course meals. 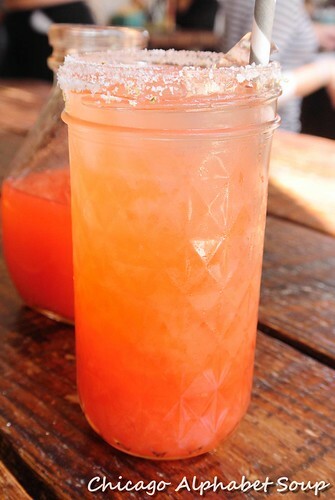 And the strawberry ginger margaritas were perfect for washing everything down. Not heavy on the alcohol, I didn’t realize how much was in it until I got home and felt a need for a nap. 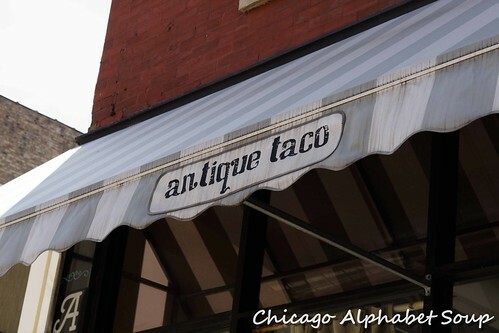 Antique Taco seems to be a hot spot, much like most restaurants in Wicker Park. Although I arrived shortly after the doors opened for business, about 30 minutes into my dining experience, the restaurant filled to capacity and there was a long line at the door. I get the allure. If you want to enjoy your meal inside, I suggest and highly recommend that you arrive at the opening of business. Now, one thing to note is that Antique Taco may be couched in Mexican cuisine. However, they add a twist to the menu items that make you want to try something new every time I go there. I have no idea where the name for the restaurant came from. What I will say is I love the “new” take on a Mexican staple. A year ago while on my way home from having sated myself senselessly, I received a text message from a great friend with an accompanying photo. Not that I was in any position to eat anything, I did marvel at the appetizing items he had sent in the text message — and in the subsequent text messages. Several months later he sent another text message with more photos and a recommendation that I should venture out to the West Suburbs to sample the small dishes at the restaurant that he was advertising with relish. Fast forward a year and I decided to take his advice finally. It was off to Altiro Latin Fusion Restaurant at 308 Anderson Boulevard in Geneva, Illinois. Because the restaurant had a swell variety of dishes to try, my great friend thought that it would be better to sample different menu items to get a range of flavours. In keeping with Latin flare in food, we had the al trio. 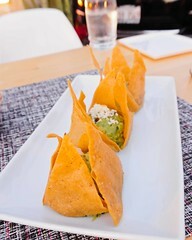 This was a flight of guacamole with homemade chips. There were pomegranate, apple, and traditional. Although I have had some “experimental” guacamole during my comings and goings, Altiro did not disappoint with their variations. And living in Chicago proper where there is a large concentration of Mexicans, I have had more elotes than I can recount. 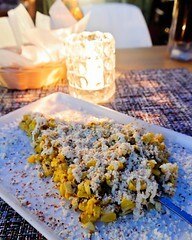 Those who love the street vendor corn on the cob will become addicted to the al elotito. This plate of roasted corn, prepared with garlic aioli, serrano pepper, epazote, onions, and cojita cheese, could easily become a wanted dish at every meal. 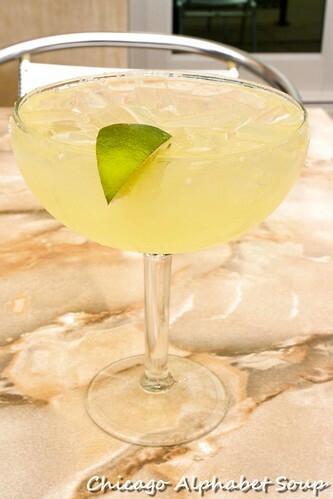 Having the al trio and al elotito with a pineapple margarita that had been mixed with a homemade chipotle pineapple ice cube and chili powder on the rim was a beautiful start. Having devoured the appetizers, it was time to begin sampling variety. Starting with the al vegetal, I was completely wowed with how the recipe yielded something flavourful like a succulent steak. 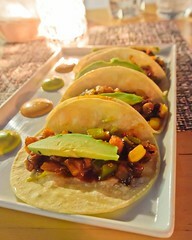 The roasted portabello mushroom, avocado, piña, bell peppers, red onions, and chipotle reduction, served with a chipotle and an avocado reduction, was a tasteful deviation from the norm of chicken, steak, pork, and beef tacos. The al camaronchizo was one of those tacos that one could fall in love with and forget that there are other kinds of tacos that you can enjoy. I have limited pork intake in my diet, but the chorizo with basque shrimp, avocado slaw, and chipotle aioli was something I forgave quickly. After a necessary moment to pause before attacking another set of tacos, there was the al fundido, a taco lovers plate of sautéed shrimp, Chihuahua cheese, red onions, and cilantro-lime oil. I had completely forgotten about fast food tacos and I had also completely discounted any of the Mexican holes in the wall in Chicago proper that prepare and sell authentic tacos. For a finale of tacos, we ordered al gallina of grilled chicken, with enchilado sauce, grilled piña, cilantro, and red onions. 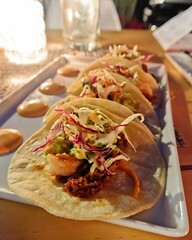 By this fourth dish of tacos, I noticed that there was distinction among all of the dishes. Per my great friend’s commentary, there is consistency in the flavouring. There certainly was consistency in the quality. We gave ourselves a bit more time to let our bellies settle before indulging a postre. I was riding the commuter train back into downtown Chicago and wanted to stay awake, so we opted for something light. Without looking at the menu, I rattled off to the server to surprise us. He obliged. There was a dessert platter that looked like sushi. What we received were four key lime cylinders, topped with strawberry quarters, and indeed looking like something from a sushi bar menu. 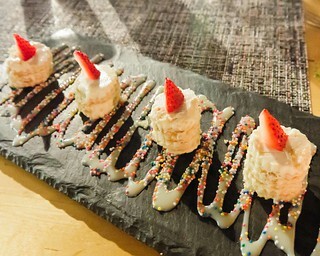 Ever so grateful that the dessert was light, we consumed it slowly, because it would have been a crime to have left any. 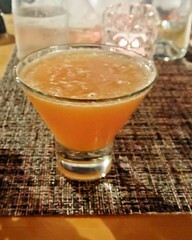 And to cancel out my desire to stay alert on the commute back into downtown, I had a guava margarita. I have no willpower. 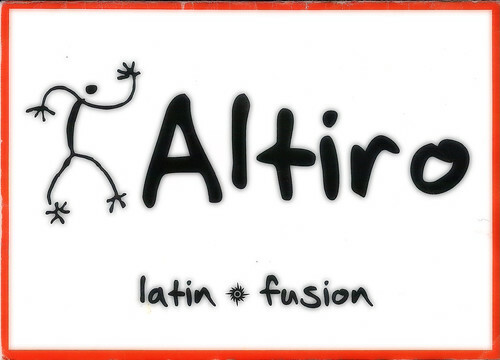 Altiro Latin Fusion is truly off the beaten path. When people go to Geneva, there are two main strips that everyone crowds. However, Altiro is down a side road on a residential street. Clearly the only way one would discover the restaurant is by getting lost or by inquiring of someone who has gone to Altiro where the exact location is. 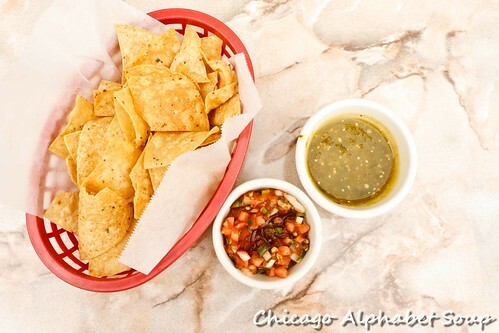 Because I have had taco overload since moving to Chicago in 1994, I have not been excessively quick to go to any Mexican restaurants or fast food restaurants that serve Mexican fare. 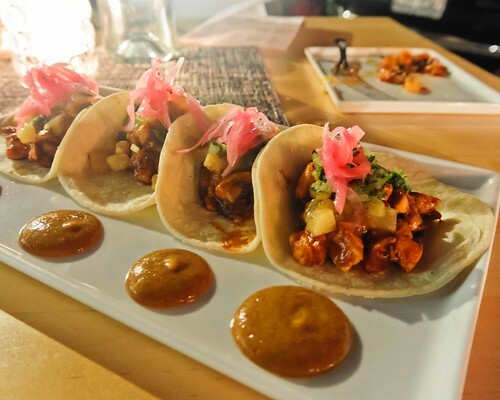 Sure, Altiro serves Latin fare, but they add enough pizzazz to their items that after the first bite of food from any other Latin restaurant, you may want to throw your plate against the wall. Well, it may be better to simply request the check and make the trek out to Geneva instead. Altiro Latin Fusion will be there. You should be there, too.